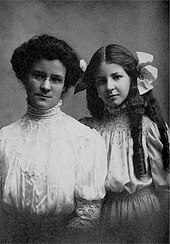 Katharine Cook Briggs and Isabel Briggs Myers extrapolated their MBTI theory from Carl Jung's writings in his book Psychological Types. The four pairs of preferences or "dichotomies" are shown in the adjacent table. 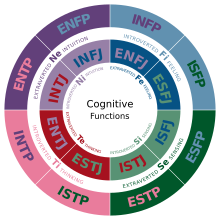 A diagram depicting the cognitive functions of each type: A type's background color represents its dominant function and its text color represents its auxiliary function. The MBTI sorts for type; it does not indicate the strength of ability. It allows the clarity of a preference to be ascertained (Bill clearly prefers introversion), but not the strength of preference (Jane strongly prefers extraversion) or degree of aptitude (Harry is good at thinking). In this sense, it differs from trait-based tools such as 16PF. Type preferences are polar opposites: a precept of MBTI is that people fundamentally prefer one thing over the other, not a bit of both. People are considered the best judge of their own type. While the MBTI provides a Reported Type, this is considered only an indication of their probable overall Type. A Best Fit Process is usually used to allow respondents to develop their understanding of the four dichotomies, to form their own hypothesis as to their overall Type, and to compare this against the Reported Type. In more than 20% of cases, the hypothesis and the Reported Type differ in one or more dichotomies. Using the clarity of each preference, any potential for bias in the report, and often, a comparison of two or more whole Types may then help respondents determine their own Best Fit. No preference or total type is considered better or worse than another. They are all 'Gifts Differing', as emphasized by the title of Isabel Briggs Myers' book on this subject. Compelling anyone to take the MBTI is considered unethical. It should always be taken voluntarily. The result of the MBTI Reported and Best Fit type are confidential between the individual and administrator, and ethically, not for disclosure without permission. The results of the assessment should not be used to "label, evaluate, or limit the respondent in any way" (emphasis original). Since all types are valuable, and the MBTI measures preferences rather than aptitude, the MBTI is not considered a proper instrument for purposes of employment selection. Many professions contain highly competent individuals of different types with complementary preferences. People should always be given detailed feedback from a trained administrator and an opportunity to undertake a Best Fit exercise to check against their Reported Type. This feedback can be given in person, by telephone or electronically. The table organizing the sixteen types was created by Isabel Myers (an INFP person). Estimated percentages of the 16 types in the United States population. These break down the uniqueness of individuals into greater detail, by bringing to light the subtle nuances of personality type; thus avoiding the reduction of all of personality to just the 16 types. The closer the number is to 1.0 or −1.0, the higher the degree of correlation. Researchers have reported that the JP and the SN scales correlate with one another. One factor-analytic study based on (N=1291) college-aged students found six different factors instead of the four purported dimensions, thereby raising doubts as to the construct validity of the MBTI. 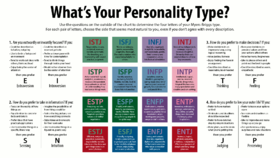 “ The interesting – and somewhat alarming – fact about the MBTI is that, despite its popularity, it has been subject to sustained criticism by professional psychologists for over three decades. One problem is that it displays what statisticians call low "test-retest reliability." So if you retake the test after only a five-week gap, there's around a 50% chance that you will fall into a different personality category compared to the first time you took the test. A second criticism is that the MBTI mistakenly assumes that personality falls into mutually exclusive categories. ... The consequence is that the scores of two people labelled "introverted" and "extroverted" may be almost exactly the same, but they could be placed into different categories since they fall on either side of an imaginary dividing line. ^ a b c MBTI basics, The Myers-Briggs Foundation, 2014, Retrieved 18 June 2014. ^ Myers-Briggs Type Indicator (MBTI), CPP.com, Menlo Park, CA, 2014, Retrieved 18 June 2014. ^ Block, Melissa (September 22, 2018). "How The Myers-Briggs Personality Test Began In A Mother's Living Room Lab". NPR. Retrieved 23 September 2018. ^ page 34 in Huber, Daniel; Kaufmann, Heiner; Steinmann, Martin (2017). "The Missing Link: The Innovation Gap". Bridging the Innovation Gap. Management for Professionals. pp. 21–41. doi:10.1007/978-3-319-55498-3_3. ISBN 978-3-319-55497-6. ^ Pearman, Roger R.; Albritton, Sarah C. (1997). I'm Not Crazy, I'm Just Not You (1st ed.). Davies-Black. xiii. ISBN 978-0-89106-096-3. ^ Kaplan, R. M.; Saccuzzo, D. P. (2009). Psychological Testing: Principles, Applications, and Issues (7 ed.). Belmont, CA: Wadsworth. p. 502. ISBN 978-0-495-50636-2. ^ "Goodbye to MBTI, the Fad That Won't Die". Psychology Today. Retrieved 2018-03-19. ^ a b c d e f g h i Pittenger, David J. (November 1993). "Measuring the MBTI ... And Coming Up Short" (PDF). Journal of Career Planning and Employment. 54 (1): 48–52. ^ a b c Gardner, William L; Martinko, Mark J (2016). "Using the Myers-Briggs Type Indicator to Study Managers: A Literature Review and Research Agenda". Journal of Management. 22 (1): 45–83. doi:10.1177/014920639602200103. ^ a b Boyle, Gregory J (1995). "Myers-Briggs Type Indicator (MBTI): Some Psychometric Limitations". Australian Psychologist. 30 (1): 71–4. doi:10.1111/j.1742-9544.1995.tb01750.x. ^ McCrae, R.; Costa, P. (1989). "Reinterpreting the Myers-Briggs Type Indicator from the perspective of the five-factor model of personality". ^ a b c "The Story of Isabel Briggs Myers". Center for Applications of Psychological Type. Retrieved 2017-03-29. ^ a b "The TYPE Writer: "It Happened In 1943: The Myers-Briggs Type Indicator Turns 60 Years Old"" (PDF). Retrieved 2009-07-29. ^ "Guide to the Isabel Briggs Myers Papers 1885–1992". University of Florida George A. Smathers Libraries, Department of Special and Area Studies Collections, Gainesville, FL. 2003. Retrieved 2005-12-05. ^ a b c d Myers, Isabel Briggs; McCaulley Mary H.; Quenk, Naomi L.; Hammer, Allen L. (1998). MBTI Manual (A guide to the development and use of the Myers Briggs type indicator) (3rd ed.). Consulting Psychologists Press. ISBN 978-0-89106-130-4. ^ a b c d Carroll, Robert Todd (January 9, 2004). "Myers-Briggs Type Indicator-The Skeptic's Dictionary". Retrieved 2004-01-08. ^ a b c d e Reynierse, James H. (2009). "The Case Against Type Dynamics" (PDF). Journal of Psychological Type. 69 (1): 1–20. ^ a b c d e Myers, Isabel Briggs; Mary H. McCaulley (1985). Manual: A Guide to the Development and Use of the Myers-Briggs Type Indicator (2nd ed.). Palo Alto, California: Consulting Psychologists Press. ISBN 978-0-89106-027-7. ^ a b Eysenck, H.J. Genius: The Natural History of Creativity (1995 ed.). p. 110. ^ Eysenck, H.J. Genius: The Natural History of Creativity (1995 ed.). p. 179. ^ Zeisset, Carolyn (2006). The Art of Dialogue: Exploring Personality Differences for More Effective Communication. Gainesville, FL: Center for Applications of Psychological Type, Inc. p. 13. ISBN 978-0-935652-77-2. ^ Nettle, Dr. Daniel. "Personality: A user guide". The Open University. Retrieved 2013-04-17. ^ Tieger, Paul D.; Barbara Barron-Tieger (1999). The Art of SpeedReading People. New York, NY: Little, Brown and Company. p. 66. ISBN 978-0-316-84518-2. ^ "Hierarchical Confirmatory Factor Analysis of the Myers-Briggs Type Indicator" (PDF). Archived from the original (PDF) on 2003-06-19. Retrieved 2008-09-14. ^ Rebecca L. Oxford (1996). Language learning motivation: pathways to the new century (Google Book). ISBN 9780824818494. Retrieved 2012-01-27. ^ Myers, Isabel Briggs; McCaulley Mary H.; Quenk, Naomi L.; Hammer, Allen L. (1998). MBTI Manual (A guide to the development and use of the Myers Briggs type indicator) p.131. Consulting Psychologists Press; 3rd ed edition. ISBN 0-89106-130-4. ^ "CAPT Step III". Archived from the original on May 9, 2008. Retrieved 2008-09-14. ^ a b c "Ethics for Administering the MBTI Instrument". Retrieved 2009-02-15. ^ "CAPT—Center for Applications of Psychological Type". Retrieved 2010-06-19. ^ "The Personality Junkie: The Functional Stack (Typology 301)". Retrieved 2016-11-12. ^ "MBTI® Step II – uncovering the DNA of personality Type - OPP". Opp.com. Retrieved 18 August 2017. ^ "The Myers & Briggs Foundation - MBTI® Step II™ Instrument". Myersbriggs.org. Retrieved 18 August 2017. ^ a b c d e f McCrae, Robert R; Costa, Paul T (1989). "Reinterpreting the Myers-Briggs Type Indicator from the Perspective of the Five-Factor Model of Personality". Journal of Personality. 57 (1): 17–40. doi:10.1111/j.1467-6494.1989.tb00759.x. PMID 2709300. ^ Costa, P.T., Jr. & McCrae, R.R. (1992). Revised NEO Personality Inventory (NEO-PI-R) and NEO Five-Factor Inventory (NEO-FFI) Manual. Odessa, FL: Psychological Assessment Resources. ^ Boyle, Gregory J; Stankov, Lazar; Cattell, Raymond B (1995). "Measurement and Statistical Models in the Study of Personality and Intelligence". In Saklofske, Donald H.; Zeidner, Moshe. International Handbook of Personality and Intelligence. pp. 417–46. doi:10.1007/978-1-4757-5571-8_20. ISBN 978-1-4419-3239-6. ^ "An Empirical Investigation of Jung's Personality Types and Psychological Disorder Features" (PDF). Journal of Psychological Type. 58: 33–6. 2001. ^ a b Coffield F, Moseley D, Hall E, Ecclestone K (2004). "Learning styles and pedagogy in post-16 learning: A systematic and critical review" (PDF). Learning and Skills Research Centre. Archived from the original (PDF) on 2008-12-05. ^ Pittenger, David J (2005). "Cautionary comments regarding the Myers-Briggs Type Indicator". Consulting Psychology Journal: Practice and Research. 57 (3): 210–21. doi:10.1037/1065-9293.57.3.210. ^ Hogan, Robert (2007). Personality and the fate of organizations. Mahwah, NJ: Lawrence Erlbaum Associates. p. 28. ISBN 978-0-8058-4142-8. OCLC 65400436. ^ a b Stricker, Lawrence J; Ross, John (1964). "An assessment of some structural properties of the Jungian personality typology". The Journal of Abnormal and Social Psychology. 68 (1): 62–71. doi:10.1037/h0043580. PMID 14105180. ^ a b c d Schuwirth, L (2004). "What the educators are saying". BMJ. 328 (7450): 1244. doi:10.1136/bmj.328.7450.1244. PMC 416604. ^ a b Bess, T.L. & Harvey, R.J. (2001). "Bimodal score distributions and the MBTI: Fact or artifact?". The Annual Conference of the Society for Industrial and Organizational Psychology, San Diego 2001. ^ Read "In the Mind's Eye: Enhancing Human Performance" at NAP.edu. 1991. doi:10.17226/1580. ISBN 978-0-309-04747-0. ^ Furnham, A (1990). "Faking personality questionnaires: Fabricating different profiles for different purposes". Current Psychology. 9: 46–55. doi:10.1007/BF02686767. ^ Francis, Leslie J; Jones, Susan H (2000). "The Relationship Between the Myers-Briggs Type Indicator and the Eysenck Personality Questionnaire Among Adult Churchgoers". Pastoral Psychology. 48 (5): 377–83. doi:10.1023/A:1022036504232. ^ "MBTI Type at Work". Retrieved 2010-08-04. ^ "Forer effect from the Skeptic's Dictionary". ^ a b Keirsey, David (1998). Please Understand Me II: Temperament, Character, Intelligence. Del Mar, CA: Prometheus Nemesis Book Company. ISBN 978-1-885705-02-0. ^ Sipps, Gary J; Alexander, Ralph A; Friedt, Larry (2016). "Item Analysis of the Myers-Briggs Type Indicator". Educational and Psychological Measurement. 45 (4): 789–96. doi:10.1177/0013164485454009. ^ Krznaric, Roman (May 15, 2013). "Have we all been duped by the Myers-Briggs test?". Fortune Magazine. ^ Harvey, R J (1996). "Reliability and Validity". In Hammer, A.L. MBTI Applications: A Decade of Research on the Myers-Briggs Type Indicator. Palo Alto, California: Consulting Psychologists Press. pp. 5–29. ISBN 978-0-89106-094-9. ^ Carskadon, TG & Cook, DD (1982). "Validity of MBTI descriptions as perceived by recipients unfamiliar with type". Research in Psychological Type. 5: 89–94. ^ Dawes, Robyn (2004). "Time for a critical empirical investigation of the MBTI: Case and Phillipson are right to highlight the pre-scientific roots of the MBTI, but they fail to separate the issue of the validity or usefulness of the MBTI from the issue of the validity of its origins. (Myers-Briggs Type Indicator)". European Business Forum (18). ^ Capraro, Robert; Margaret Capraro (2002). "Myers-Briggs Type Indicator Score Reliability across Studies: A meta-analytic reliability generalization study". Educational and Psychological Measurement. 62 (62): 590–602. doi:10.1177/0013164402062004004. ^ "The Myers-Briggs Company Products". Retrieved 2009-06-20. ^ Schaubhut, Nancy A.; Nicole A. Herk; Richard C.Thompson (2009). "MBTI Form M Manual Supplement" (PDF). CPP. p. 17. Retrieved 2010-05-08. ^ Thompson, Bruce; Borrello, Gloria M (2016). "Construct Validity of the Myers-Briggs Type Indicator". Educational and Psychological Measurement. 46 (3): 745–52. doi:10.1177/0013164486463032. ^ Capraro, Robert M; Capraro, Mary Margaret (2016). "Myers-Briggs Type Indicator Score Reliability Across: Studies a Meta-Analytic Reliability Generalization Study". Educational and Psychological Measurement. 62 (4): 590–602. doi:10.1177/0013164402062004004. ^ Hunsley J, Lee CM, Wood JM (2004). "Controversial and questionable assessment techniques". In Lilienfeld SO, Lohr JM, Lynn SJ. Science and Pseudoscience in Clinical Psychology. Guilford. pp. 39–76. ISBN 978-1-59385-070-8. ^ Letters to the Editor: It's Not You, It's Your Personality." (1992, February 3). Wall Street Journal (Eastern Edition), p. PAGE A13. Retrieved November 8, 2008, from Wall Street Journal database. (Document ID: 27836749). ^ Lok, Corie (2012). "Career development: What's your type?". Nature. 488 (7412): 545–7. doi:10.1038/nj7412-545a. PMID 22919707. ^ Moshenkov, Sergei; Wing, Tung Tang (2010). MBTI and Socionics: Legacy of Dr. Carl Jung. CreateSpace. p. 216. ISBN 978-1-4528-3564-8. Bess, T.L. ; and Harvey, R.J. (2001, April). Bimodal score distributions and the MBTI: Fact or artifact? Paper presented at the Annual Conference of the Society for Industrial and Organizational Psychology, San Diego. Bess, T.L. ; Harvey, R.J.; and Swartz, D. (2003). Hierarchical Confirmatory Factor Analysis of the Myers-Briggs Type Indicator Paper presented at the Annual Conference of the Society for Industrial and Organizational Psychology, Orlando. Georgia State University. GSU Master Teacher Program: On Learning Styles. Retrieved December 20, 2004. Schuwirth, L (2004). "What the educators are saying". BMJ. 328 (7450): 1244. doi:10.1136/bmj.328.7450.1244. PMC 416604. Pearman, R.; Lombardo, M.; and Eichinger, R. (2005). YOU: Being More Effective In Your MBTI Type. Minn.:Lominger International, Inc.
Saunders, D. (1989). Type Differentiation Indicator Manual: A scoring system for Form J of the Myers-Briggs Type Indicator. Palo Alto, CA: Consulting Psychologists Press, Inc.
Wicklein, Robert C; Rojewski, Jay W (1995). "The Relationship Between Psychological Type and Professional Orientation Among Technology Education Teachers". Journal of Technology Education. 7 (1). doi:10.21061/jte.v7i1.a.5. Long, Thomas G (2016). "Myers-Briggs and Other Modern Astrologies". Theology Today. 49 (3): 291–5. doi:10.1177/004057369204900301. Wikimedia Commons has media related to Myers-Briggs Type Indicator.